During one of my visits to the nursery this week I picked up an interesting tip from one of my favorite plant experts. Yes, that is a diaper. She recommended I put a diaper in the bottom of my potted plants. It's especially helpful in small/hanging pots. It retains moisture and keeps my hanging pots from dripping. Genius! I'm not sure if I'll really see a difference, but I'll keep you posted. My little hangers did get really dry every day so maybe the diaper trick will work a little magic. If anything, the hanging pots aren't dripping like they used to, and that's certainly worth a diaper or two. I feel pretty lucky that Carson seems to like gardening as much as do. Give my guy a shovel, some dirt and a bucket of water and he's a happy camper. I had quite the proud mom moment this week when he walked into the backyard, picked up his mini rake, started raking the lawn and said "MAMA". Yep, buddy, you're a gardener just like mama, and nothing could make me happier. If you're interested in gardening, here are a couple of books that I've been really loving. If anyone has any other great gardening reads, I would love to hear about them! I love the tip for hanging baskets...I have a few of Olivia's diapers that are a size she's grown out of. It's great that Carson loves to garden, the two of you will share many hours of fun in the yard. I receive Annie's annuals catalog and love the unique plants she offers and I have the Robert Smaus book. He used to write weekly for the L.A Times before his retirement...he really did give great tips for soca gardeners. Can't wait to hear what you think about the diaper trick! I swear it's helping! Robert Smaus is great, wish he was still with The Times. Do you have any other great books you recommend? I'm devouring garden books lately! I would love your two cents, since you're quite the accomplished gardener! In fact, Jeff and I were just looking at before and after shots of our yard and it's crazy how far we've come - in part due to your help and suggestions! I think I will try the diaper in my pots and will let you know if it solves my problems of dripping pots on the deck. Great idea as they do soak up a lot and would help with the wind too. 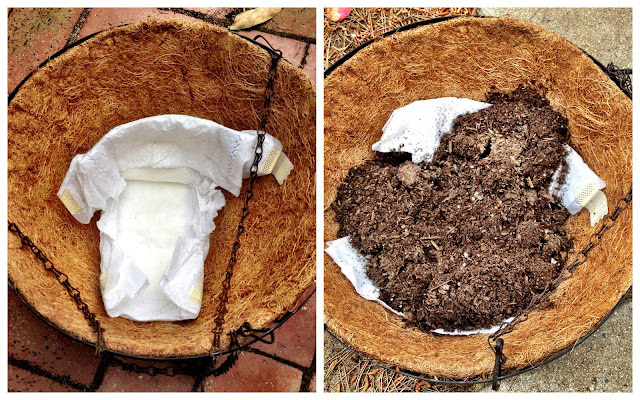 I read recently read where you can take the insides from the diaper and put it in a bucket with the soil, pour some water in and let the mix get damp. Use this to pot your plants in. It is supposed to help retain the moisture. Going to try this today. It is hard for me to remember to water my plants indoors. Like the idea of the diaper in the bottom also. The article I read said you could use a diaper that had been wet on lightly [not soaking, just no pooh.] Sanitary pads do the same thing. i would worry about mold. I will definitely try the diaper trick for my hanging baskets and especially my tomato plants next summer. To keep your pots from dripping on the porch and to help with moisture use a walmart bag in the bottom before you add dirt. It holds the extra water and doesn't drip. I don't have diapers any more and never thought of pads so been doing the bags for the past 4 years and it really works. Just another idea for you to think about. Blessings to you and your little one. How interesting I love plants, and it was super beautiful too, congratulations. Attractive section of content. I simply stumbled upon your web site and in accession capital to claim that I acquire in fact loved account your weblog posts. Any way I'll be subscribing on your feeds or even I achievement you get right of entry to consistently quickly. Great idea as they do soak up a lot and would help with the wind too. Thanks for the post. Every pro has their own unique tip. It’s great to see them all combined into one simple post! I think I will try the diaper in my pots and will let you know if it solves my problems of dripping pots on the deck. I will try to do this, thank you! Thanks for sharing. I love gardening and your blog. Great. Gardering is my life! Gardering is a lovely hobby. I found a way to recycle my child's skirt, kkkkk, can only be cleaned, ours loved the idea, because my balcony veses dirty with the ecesso of water when watering the plants, very creative !!! Great idea, I loved it. This website is very nice. Thank you. Great ! Thank you for sharing. I love gardening. I'll try to do it at home. I definitely savored every part of it and I have you bookmarked to look at new information on your site. Gostei muito do post, muito interessante a dica da fralda no fundo do vaso. Vou fazer, obrigado. very cool, did not know this tip need to test. Thanks for sharing this great post!! I liked it a lot! Thank you very much, it helped me a lot in the research. Wow, that's cool, these tips, you're going to do it too! Your baby is so cute s2.